Dreier Structural Steel derives originally from Abraham Dreier "Railings," 35 Goerck St., New York City, 1912. Goerck Street was located 2 blocks from the East River running north from Grand St. to East 3rd St. between Mangin and Lewis streets on New York's East Side. In the 1880's Thomas Edison established the Edison Machine Works at 104 Goerck St. This street was completely obliterated by the Baruch Houses development in the 1940's. The Dreier "Railings" business became Dreier Iron Works, Inc. by 1916. See the Dreier Page under Manhole Covers for a Dreier coal hole cover located on Market St. with a patent date of 1 April 1919. This carries the address 35 Goerck St. Dreier Iron Works moved to 740-742 E. 12 St., New York, in 1926 (click here for coal hole cover located on E. 84th St. near Madison Ave. with the E. 12th St. address). 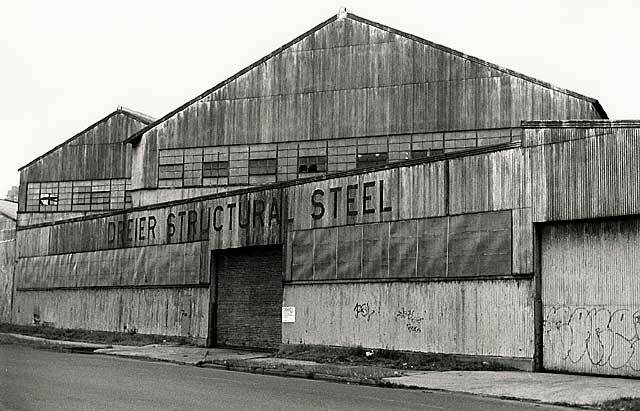 The name was changed to Dreier Structural Steel when they relocated to the Bronx (Harlem River at W. Tremont Ave.) in 1935. They moved to Long Island City (33-48 10th St.) in 1940, and moved into this building on Vernon Blvd. by 1948. Dreier also occupied a building a block east of Vernon Blvd. at 10th St. & 33rd Road (click here for 2002 image). Dreier manufactured the huge steel feet called grillages that supported the columns at the base of the World Trade Center. City in the Sky by James Glanz and Eric Lipton (2003) shows a photograph of workers hoisting into place the first piece of Dreier steel (weighing 34 tons) August 6, 1968. (The photo credit reads "Carl T. Gossett Jr. / The New York Times.") Apparently, this was the first structural element of the towers to be put into place. Glanz and Lipton comment, "The ascent to the sky had finally begun" (pg. 191). Dreier remained in business on Vernon Blvd. until the mid-1980's.